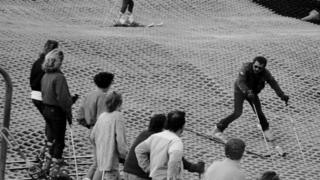 A dry ski slope used by unlikely British winter Olympic hero Eddie "The Eagle" Edwards is celebrating its 30th birthday. Swadlincote Ski Centre, in Derbyshire, opened in late 1987 after more than a year's building work. Built on a spoil tip of coal mining waste, it was opened by five-time Olympian and Ski Sunday presenter Graham Bell. The centre's bosses said it was now a challenge to "remain relevant". The 160-metre slope was built in the late 1980s by local businessman Tony Freeman. It was then sold to leisure industry and hotel entrepreneur John Nike in the 1990s, who extended the site to include a toboggan run. Eddie "The Eagle" Edwards, who famously finished last at the 1988 Calgary Winter Olympics, spent five years using the slope while at university in Leicester. "I actually thought Swadlincote was very good dry ski slope," he recalls. "It was a decent length because there were some dry ski slopes that were so tiny, you'd do one or two turns and then you'd finish. "I think there was a really nice alpine feel to it. "You had the ski slope and the toboggan run...when you were sitting in the bar you would feel like you were sitting in Austria or Switzerland". Despite endorsements from the likes of Eddie Edwards, business can be up and down and in particular, the rise of indoor, artificial slopes, has squeezed the market. "We do get a lot of schools coming to do lessons before they go on a ski trip and people coming to refresh before they go on holiday," Gemma Whetton, the slope's manager said. "Our challenge now is to increase the number of people coming after they have been on holiday and all year round".